The Elder Adahn Fights! : Sunderstrike Sings! Languages: From Most-Skilled to Least: Highland, Common, and Occitan. Philosophy: Heavy Anti-Fatalist, strong distrust of gods. Not a great show of character in my opinion, Please read the descriptions below for a much more well painted picture. Will Power: His Spiritual Capability and inner strength. Guile: Sleuthiness and Rogue-like nature. Gonir Adahn is a larger man standing at a notable height of six-foot and two inches tall, with notable musculature despite his advanced age. Gonir’s form is blessed with notable shoulders that work well with his height and muscles, showing as broad enough for notable physical effort, but not enough so to be intimidating on their own; the power of his physical form rectifies this though, his noticeable physique standing against the test of time, and giving his large form not only the ability to perform manual labor, but the assurance that it will be done. Wrinkles are set into the forehead along with well set, deep blue eyes which then yield to notable cheekbones, a large nose, slightly aged cheeks going into a very strong jawline. This jawline, as well as the head atop it, is coated in long, flowing mane of fiery red hair; this hair is bolsterous, a large rounded beard and thick whiskers sitting upon his face, as his hair flows back with a braid going against each temple. The eyes sitting in Gonir’s sockets are a potent blue color, beautiful with age, and carrying a depth like the ocean; able to stare down men and beasts with a simple blank stare, able to speak libraries of volume. Gonir’s flesh is a smidge pale, but the sun has lightly tanned his flesh over years into a moderate white hue. Gonir himself is a travelled and practiced man, with a couple scars along his hands and arms, the most prevalent one being the loss of his left ring finger from the second knuckle upwards. In addition to being rather hygienic, Gonir himself walks the lands with a calmness and light-self confidence that isn’t very common in wise men. Education and Intelligence – Overview [Poor-Average]: Gonir is a very intelligent soul, capable of learning and grasping lessons with a large amount of common sense and reason; however, he has not embraced the life of a scholar, and the lessons he has learned were not many that could be taken up in a classroom. Gonir Adahn is a powerful man who has lived through a full life, with plenty of joy and suffering; though his learning ability is great, the amount of education he has received has been little. He took up the trades of stoneworking because they were functional, easy to grasp, and they played off of his great youthful strength. Cunning and Wisdom – Overview [Depending: Adept]: In his years, Gonir has always been a wise, logical man; however, this skill has been honed even more so after his aging took the grandeur from his muscles. Gonir has spent countless days and nights pondering, thinking, scouring his soul and coming to terms with various things that have happened during his lifetime. He has come to great understandings and has been able to keep himself solid in a world that claimed his entire family before himself; his ability to reason is great, his knowledge is vast, and his wisdom perhaps surpasses that of most mortal men. Physical Survivability/Combat Ability – Overview [Adept]: Though not the man he once was, Gonir is not without the ability to fight; a hearty man of good build and mighty experience, the eldest Adahn can easily practice the ways of combat. His muscles hold true, and his skills have not been able to dull over the years; he has been in many fights over his life time, some involving fists, and some involving blades. 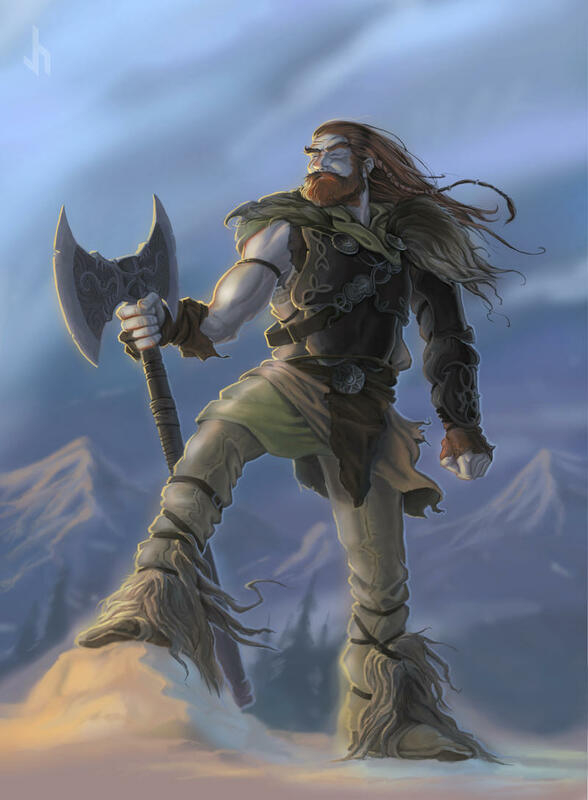 He has situated himself, in weapon use, on his mighty axe; while fighting similarly to his son, using skill, momentum, and muscle in attacks to flay opponents and break their bones, Gonir also has a call to a more brutal fighting style. Though he does not have his once incredible strength, he still has a large amount of it, and can easily fall on the more basic and savage techniques that rely solely on battering the opponent with strength, leaving multiple fractures in their wake. Arcane/Mystical Abilities – Overview [Inept/Poor]: Even before the loss of his family, Gonir has mistrusted magic to an extent, but never enough to speak against those who practice it just for that. However, following the death of his family, he cannot help but find some disgust in those, mortal or divine, who twist the lives of mortals and the world in which they live, through spellwork and alteration. Survival Ability – Overview [Adept]: Gonir’s own brother was a hunter, and he shared with him many secrets and knowings. In addition to this, Gonir’s travels and tribulations in his life have left him many times in the woods with naught but his own abilities to provide for him; Gonir is a man who knows the wilds, who can traverse them, and survive on them well enough solely on his own. -Combat Fundamentals: Gonir Adahn has always been fairly blessed with intelligence throughout his life, but also, he was blessed in athletic aptitude. Gonir himself in his prime was a monster of a man with huge form alongside his notable height. Gonir, while skilled fairly within his schools of combat, has never been afraid to fall upon savage strength and cunning; simply battering his enemies with blows that could hemorrhage his foes with blows to their armor, breaking away from his subtle weapon work to fall upon his pure strength. Even now he still does this, his strength impressive for his age near fifty, and his skills largely undulled. -Primary Weapon Specialization(s): Two-Handed Weaponry: All – Unarmed Combat: Fists. -Secondary Weapon Specialization(s): One-Handed Swords, Axes, Hammers, and Picks. -Tertiary Weapon Specialization(s): Bow/Arrow and Shield. -Two-Handed Weaponry: A solid horse stance with weapon readied for a heavy swing at a moment’s notice serves as the base for his fighting. Following this are swings, motions, and steps taken to gather momentum, and unleash it upon the opponent. Where the sword work fails, blunt force may be used as a replacement where skill and effort may fail; hacking and heaving mighty blows at his foe with a large weapon, using leverage and or momentum, bludgeoning upon them with few, heavy swings. Just as well, the size of this weapon, the force it carries, and the reach it possesses comes with a great deal of crowd control. -Fists: Relying on his strength and size, Gonir guards his frame well, and keeps his eyes affixed to his opponent. Gonir does not swing many times, but when he does, it is fast, vicious, and often from a position of power. Gonir knows how to open up a man’s defenses in a barfight, and when to swing, perhaps not the degree of a truly adept hand to hand fighter, but he has his fair share of skill gained over the years, and his build makes it that much more efficient. -One-Handed Weaponry: Less skilled in this art as to his two-handed weapon use; Gonir relies on heavy flourishes with blades, sudden ripping swings from his axes, and other simple techniques and movements with his one handed weapons as a supplement for a lack of practice and experience with them. In more general use, Gonir focuses on less strikes, making them more precise, and in some encounters trying to have his opponent wind themselves. However, in the condition of axes and hammers, Gonir has learned through his younger days how to throw them accurately. Born under the bright sun of the high hills, Gonir Adahn was born and raised into an active and colorful culture gifted to the Dragon Coast Highlands; an active and athletic youth as well as possessing an innate degree of mental fortitude, he was indeed a promising young man. Greater his interest in living than learning, Gonir would take up physical trades and live a thorough life with his friends and comrades. In his youth, Gonir had many friends, but some more valuable than others; in his young adult years, he would adventure across the land with three of his best friends: A hunter a wise woman, and another fighter. They would adventure and laugh heartily in taverns, enjoying themselves; though they would never be sung of in songs or tales, they enjoyed waht time they spent along the roads. Eventually Gonir would settle back in his home with his greatest friend, and they would bear two children. Gonir would establish his life with his trade, and he would enjoy many healthy years with his family. However, one fateful day, this would all change; following tension between various powers within the highlands, clan-warfare would ensue, and one such fight would claim the lives of all but his youngest son. Mustering his resolve and living alongside his son, he would be stricken again when in the next year, his son would foster grief and trauma over the events that had befallen him. Within another year, his son would be gone, headed onto the roads to find his own path; leaving Gonir to worry and lament on his own. Fraught between feeling unable to protect his loved ones from death or despair, he would fester these wounds for a time, going through the stages of grief and mourning. He would on occasion exchange letters with his son when word reached him, but such times were far and few between. After almost a decade of this pattern, Gonir decided that it was time he cast these wounds aside. Leaving behind everything he's known for almost thirty years, his security, and even in his old age, he vows to find his lost son. The last letter he received suggested that he would be spending some time in Surna, and after a month or two of intrepid jauntings along the roadway with only the axe his son made him, Sunderstrike, to keep him company, he moves headlong to Surna to embrace the only family he has left. Upon arriving in Surna, he did not immediately make contact with his son, or vice versa; fear and anxiety claimed them both. It was only after a few meetings of Aedelric's close friends, and his soon to be (now) Daughter-in-law, that he would meet his son once again. He would appear to walk his daughter-in-law down the aisle at their wedding, and take part in flaying with berserking rage any of the wedding-attackers who dared crossed his axe. In addition to settling with his son nearby, he has vowed to personally slaughter anyone who dares attempt such an attack again, upon any member of his family. He has lived with the pain of loss and forlorn emotions for over a decade; he would sooner die than feel it once again. -Born and Grew up in the highlands. -Raised well and very athletic as a youth. He has set boulder-throwing records in several villages. -Intelligent, but not interested in schooling, grew around what interested him. -Learned about the world, wanted to travel it, but was never able to. -Found himself wandering the countryside, before settling down with his best friend turned love. -Made a living as a miner, stonecutter, and mason. -Lived a happy life with his family. -One year, he lost his entire family. His wife and oldest son slain, his youngest son would leave him. -His youngest son, wracked by trauma, took his leave of their home and left to find his own way and peace. -Ten years have passed since then, with sparse letters the only thing between him and his son. -A growing coldness in his chest, an ache shadowing over his home, he knows he cannot live this way anymore. -He journeys to Surna, to meet his son once again after nearly a decade. Sundersmite – A parting gift to from his son the day that they did part; Sundersmite is a mighty two handed, double sided axe, meant for Gonir’s hand alone. It is a mighty thing that finds great use in its master’s hands, the beautiful steel and well treated wood singing as it rips through air and armor. This was meant to replace the family sword that Aedelric had taken with him when he left Connor, along with satisfying his father’s love of the axe. More so than just a replacement, this is something of a great treasure to Gonir; a gift from his only living son, both pleasant and painful. At one time, Gonir’s great muscles could bludgeon a man to defeat through heavy armor with this mighty weapon; while he cannot do so yet, he is still more than capable of dislocating/breaking bones, as well as entirely maiming an opponent. Heavy Pickaxe – Though not always carried on his person, this is an item that Gonir carries with him and keeps at his dwelling. Gonir Adahn has spent his years as a stonesman by trade, and has served as miner, cutter, and mason. This is a particularly hardy tool that has seen plenty of use, and will continue to see more. Stoneshaper’s Shiv – A simple knife half-crafted by Gonir’s hand, this simple blade has served him well along his way. The iron blade requires simple upkeep but nothing he can’t provide, and he keeps the grip well wrapped; it is a useful tool that’s served utility and combat well. Broadtrekker’s Brassard – A piece of armor consisting of a leather jerkin, leather shoulder—guard, arm-guard, and bracer; they are fashioned from boiled leather, they are light, and of good solid quality. Tumbling Throwing Hammer – A simple, but large and balanced hammer that can be used for utility purposes, and can be thrown at an opponent from a distance..
Roughstitched Cloth and Fur Garb – Simple clothing helped with furs. Achievement Gained: Just a Flesh Wound - Get stabbed in the tavern, walk it off, have no one help you. Achievement Gained: Ten Years Have Passed - Be reaquainted with your long lost son. Achievement Gained: Addition - Have a new person enter your family. Achievement Gained: Fear - Have your worst nightmare almost come to pass. Achievement Gained: Blood Oath of Vengeance - If you get your hands, and or axe, on someone, they're going to pay. I would like this character to be allowed access to Jordan as well, to allow for us to, through coordination, create a more thorough experience with this character in passive and perhaps in future events. Such events could include Aedelric reuniting with his father, Simon arresting Gonir, etc. You're a great roleplayer, and I trust you can handle the special items that you requested. As for the character, perfectly acceptable in my books. Got my approval. Kosher nothing much to say. Your biography isn't really a biography more than it is a description of skills and items. I don't care how he fights or what color his item names are. However, I do like the quote and how you included pronunciations of things. That's something few people think about. You clearly put a lot of effort into your characters, and even though your descriptions of skills and items far outshine everything else, they do provide some insight into the character, which is good. I'll accept this, but I would urge you to expand the biography past a simple checklist. I do intend to, I should've put WIP, but the issue is, is that I'm not sure WHEN I'm going to expand it. I'll post letting everyone know when I do, but sadly, school is just taking up a lot of time; and truth be told, I've been going back and forth between this and Metallurgy post. The Biography is Finished. = ) Sorry it took so long, Metallurgy is still going to be awhile, but I wanted to get this done first.